We are pleased to provide Essay Writing competition 2019 Application forms and winners list Position wise over here. Essay Writing competition 2019 is going to be held for the children of the Federal Government employees and employees of autonomous bodies who are covered under section 2(4) of the FEBF & GI Act 1969. All the students who have passed matriculation or undergraduates candidates or having equivalent qualification they are eligible for the Essay Writing competition. Interested Students have to make sure that they fulfilled required criteria to be able to apply for the competition. 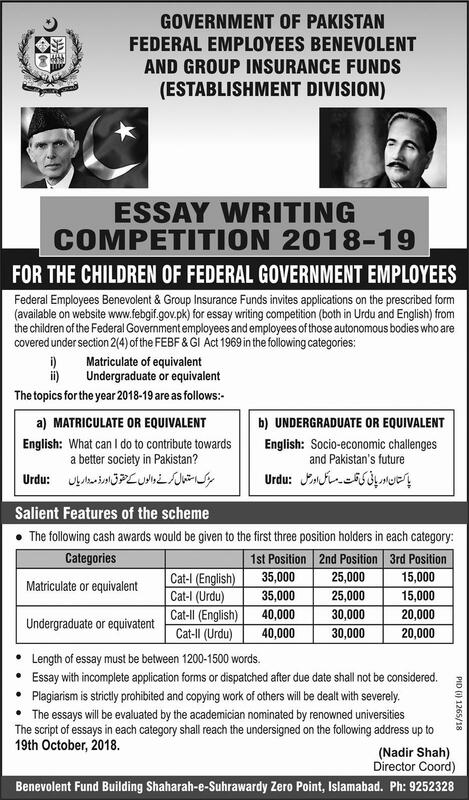 Federal Employees Benevolent Fund and Group insurance has organized Essay Writing competition and invites applications from the eligible candidates in both Urdu and English. Applicants can apply through downloading the application form and then submit it to the prescribed address below. All the candidates who are seeking for the online Application form for the Essay Writing competition in English and Urdu they can download online Application form over here. competition in Urdu and English from the eligible candidates who meet the criteria they should visit this site. Here you will get online Application form for the Essay Writing Competition below. Students will get all the information and instructions how to apply procedure, eligibility criteria and details about competition over here. All the interested students should know that late submission or incomplete application form will not be entertained. Applicants who want to download application form they should click on the link given below. English: What can I do to contribute towards a better society in Pakistan? Taking someone else’s work strictly forbidden and copying other candidates work will be dealt very badly.